NOS 335 from Guitar Center? Discussion in 'Guitars in General' started by bluesun, Apr 23, 2016. Was looking at 335s, and I see Guitar Center has some 335s from 2014 that are much cheaper than the newer ones. Is there much difference between these models? That model of 335's were real nice. The satin finish keeps the price lower.. Love those block inlays on the neck.. Get one for me too..I want a red one! 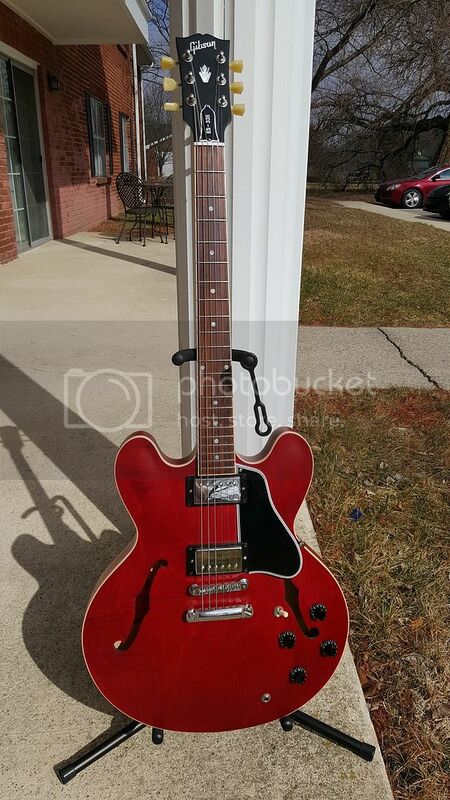 I scored a brand new 2012 ES-335 in cherry red from a G.C 2 months ago on clearance for $1399. There is another G.C near me selling a ES-335 on clearance for $1799. If you want the number P.M me and I'll send it to you. Thanks, I just have to figure out if I have a preference between the '57 and the burstbuckers. Sounds like another good reason to go for the 14. Dang! That's some good prices! I named her "Ms. Cherry forever"! SPROING!, BBBJay, bulbasaur_85 and 1 other person like this. I have a 2015 satin...Beautiful guitar. Gibson raised the price of the 2016's by $300...it's the same guitar. As mentioned before the 2014 have Classic 57's and the 2015/16's have Burstbuckers. The 57's for the win IMO.